Hi everyone! Laurie Schmidlin here with you today! 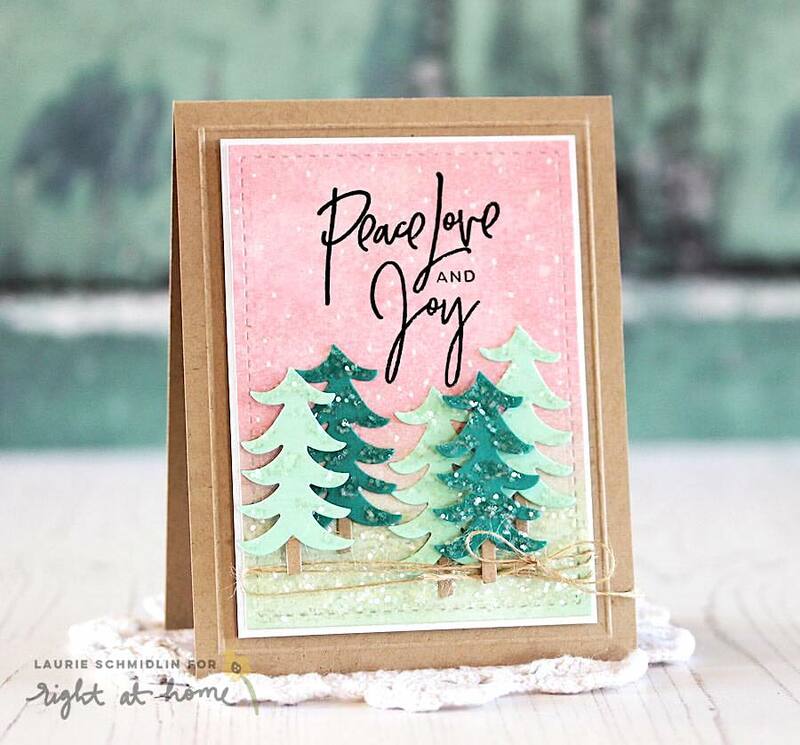 I'm excited to be sharing a card I created using some of the latest Right at Home stamps and dies! I was so taken with the cute little tree from the Holidays are on the Way Die Set! The whole die set is SO cute and I actually have plans to use that car all year long. I started by sponging the background using a couple of Distress Oxide inks. I wanted it to have a frosty look, so I added some white dots with a white gel pen. I embossed the sentiment from the Peace Love Joy stamp set. I adore the font Nicole used in this set SO much! Because you can never have enough sparkle, I added some chunky clear glitter to the trees. For embellishment, I tied on some rustic string. Can I just say "brrrrr"? I know in my last post I was saying that in MA we were just on the cusp of cold weather...well, it has fully set in now and I am oh, so happy. Bring on the boots and comfy sweaters! And after I'm all bundled up and warm I think I'll hop into one of these cars on today's cards. Aren't they just too cute?! Let me show you how I made them! You may recognize the card with the red car from last week's Fall Seasonal Wreath Cards post. I explained my entire process in that post, but wanted to make sure to include it today as it uses the Holidays are on the Way Die Set. I switched up the scene for my second card in a couple different ways: I changed the orientation to vertical and decided to create a winter scene instead. I started by creating my background with the My Favorite Things Mini Cloud Edges Stencil and Cracked Pistachio Distress Oxide Ink. This piece acts as the perfect backdrop for my scene. On top I created a snow bank using a border die with some stitching. I love how it creates the look of snow piles. To ground the scene, I added three trees created from the same die set that I inked with Peeled Paint Distress Oxide Ink and Vintage Photo for the stumps. ...that's when I decided to bring in some of the poinsettias and leaves from the die set to help break up the white space. I inked the flowers in Candied Apple and the one leaf in Lucky Clover. For the centers I used some Nuvo Drops. I also added some of the White Blizzard Nuvo Drops along the tree branches and car to look like freshly fallen snow. You can see how I assemble the car and some of the other elements included in the die set in the how to video below! And that finishes up my Holidays are on the Way scene cards! I hope you enjoyed taking a peek at these and leave inspired. I rarely create cards using solely die cuts so these were a bit out of my comfort zone...but I love the result! Let me know which card is your favorite in the comments...and what other types of cards you want to see from me! I hope you're enjoying the fall season so far. Here in MA we're finally starting to feel the cooler temps more consistently. Up until now you could find me wearing flip flops one day and boots the next. Oh, New England. Anyway, the weather here on the blog today is a crisp 60 degrees with a slight breeze thanks to these beautiful fall cards I created. I have two different designs to share with you so grab a cup of your favorite brew and a blanket to bundle up in and let's get started! Both cards feature the Seasonal Wreath Die Set from my Fall / Holiday release. This die set is unique in that I designed it to feature dozens of little elements that will help you decorate your wreath for all the seasons. Since we're well into November, I decided to share a harvest style wreath card. I started by inking up a sheet of Bristol Smooth Cardstock with the Antique Linen Distress Oxide Ink from Ranger. Then I die-cut the wreath from it. I also cut two additional wreaths from white cardstock that I will layer underneath to create dimension. For the leaves, I wanted to have them be varied in color so I inked up another sheet of Bristol cardstock with a mixture of Distress Oxide Inks. I used Candied Apple, Peeled Paint, Fossilized Amber, Wild Honey, and Vintage Photo for the stems and my bow. I spritzed the paper with water to get the oxidized look and die-cut several leaves. I arranged them all onto my wreath and adhered them with my new favorite glue by Tonic Studios. Then I popped the wreath onto my card base made using some woodgrain cardstock. In the center I stamped my sentiment from Be Thankful. I had to stamp it several times to get all the ink to transfer onto the textured paper. #thankgoodnessfortheMISTI I added a few Nuvo Crystal Drops and my first card is finished! You can see a bit of my process in this how to video! My next card pulls in another die set from my Fall / Holiday collection called Holidays are on the Way Die Set. Even though the name includes "holidays", this cute car can be used for any time of the year. This card also includes a lot of ink blending using the Ranger Distress Oxide Inks...not sure how I made cards before them. I started with my cloud background which I created using Cracked Pistachio and the My Favorite Things Mini Cloud Edges Stencil. Absolutely obsessed with the effect it creates! Perfect for scene cards. You can see how I use this stencil to create another scene card here. Then I inked up a little hill shaped piece with Peeled Paint. I knew I wanted to have my car look as though it was driving over a leaf-filled road. I also pulled in some of the leaves I created from the last card. I always cut extra so I have them ready to go. I assembled my car, inked in Candied Apple, and added some vellum behind the window for a glass-like look. Behind the car, I added some trees inked in Lucky Clover. I love the contrast this creates against the sky and bright red car. And there you have it! Two colorful fall cards featuring different elements from my Seasonal Wreath Die Set! I hope you enjoy these cards and are inspired to create something similar. I had way too much fun getting inky and even more fun putting this post together for you. Let me know which card is your favorite in the comments...I'm thinking mine if the car card but they're both oh, so cute!